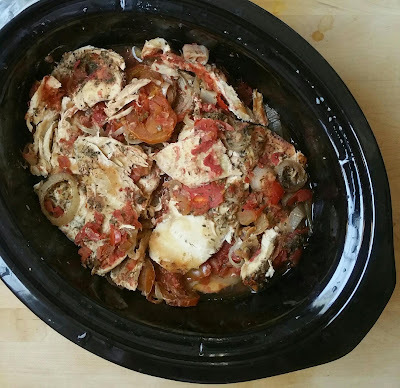 This is one of my favorite recipes next to my Crockpot salsa chicken which is very similar, minus the veggies and tomatoes. All you need for this are a few ingredients, a crock pot and 6 hours! I make a LOT of chicken because I meal prep this for the week so adjust the quantity accordingly. --Seasoning of choice. I use coconut lime seasoning from Sam's club or No salt seasoning from Costco. Both are delish! 1. Place a layer of chicken breasts in a slow cooker and sprinkle seasoning on top. Then squeeze a lemon and layer tomatoes, onions, salsa and italian canned tomatoes on top. 3. Cover and cook on high for 6 hours (or low for 8 hours), or until the chicken comes apart easily with a fork. 5. Serve with vegetables, as tacos with tortillas, over quinoa or rice, with pasta, over a salad or by itself. It is delish either way. And you can add any veggies you'd like such as mushrooms, bell peppers, etc. *To make it the cleanest way possible, use no salt seasoning, low sodium canned tomatoes and organic salsa. Simple Breakfast Just in Time for the 4th!